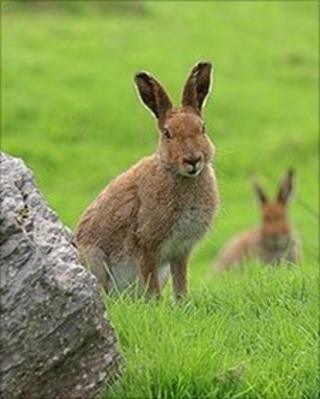 The Irish hare is under threat from the European 'brown' hare, according to a study from Queen's University. But Dr Neil Reid from Quercus (Queen's University's Centre for Biodiversity and Conservation Science), said: "Our native hare remains vulnerable to another serious threat - that of the invading European hare." Dr Reid added: "The Irish hare represents an evolutionary unique lineage, which is restricted to Ireland where it has been present since before the last glacial maximum, making it one of our few native mammal species. "Hence, it has been isolated for 30,000-60,000 years. So the discovery that both species are hybridising in the wild is very worrying."